Chick-fil-A is causing traffic jams around its new location at 185th in Hillsboro. But are there better choices in Portlandia, and even not so far from it in suburbia? The Atlanta chain last had outlets in Oregon in 2003, and much has changed in the interim for Portland and the rest of the country. 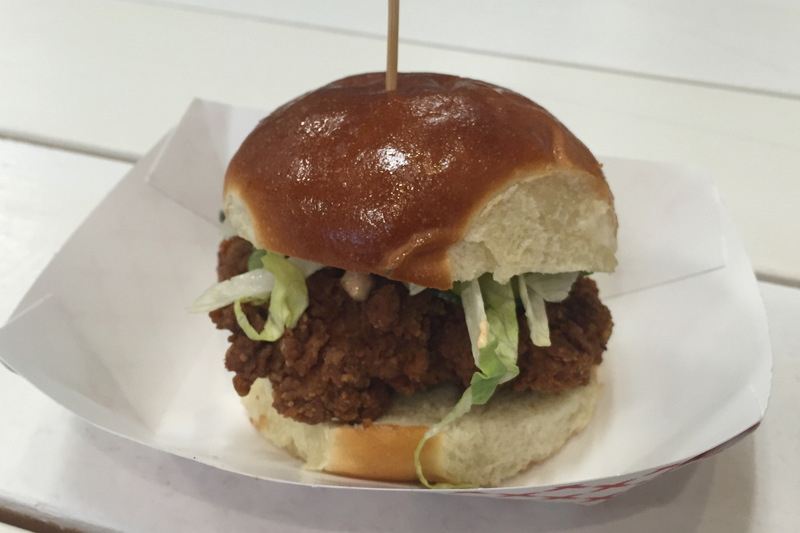 Here’s how it stacks up to some local fried chicken sandwiches. They are presented in alphabetic order. Basilisk is one of the micro-restaurants at The Zipper at 27th and NE Sandy Blvd. This is what a fried chicken sandwich should be – juicy thigh meat coated with crunchy, savory, salty-enough coating, with slaw and pickles to add a sweet/sour component. I detected a bit of spice, but I think next time I’ll give it a sprinkle of the sriracha sauce they provide. If you don’t want chicken, they do the same thing with tofu. This $8 sandwich will fill you up and satisfy you. I wouldn’t have had room for their Kool-Aid soft-serve of the day. 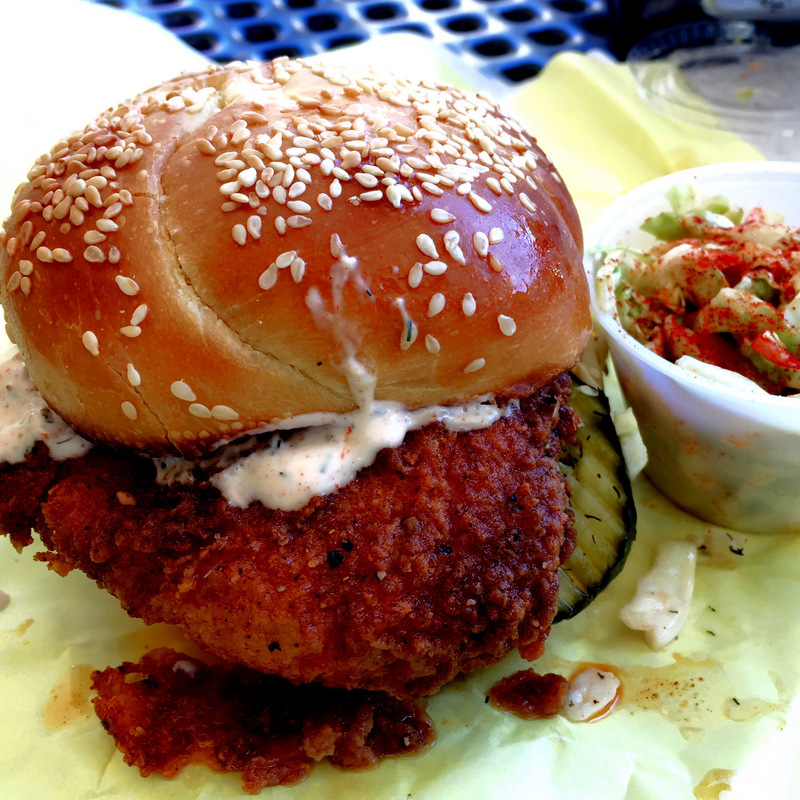 The Pearl Bakery bun tastes buttery and holds together despite all of the crunchy fried chicken. You can sit inside at Basilisk or the dining court, or outside. Beer and cider are available as well as soft drinks. They are open for lunch and dinner and I had no problem finding parking a couple of blocks away. If you’re on Hwy 26 west, take a short detour over to Bethany Village to Cackalack’s Hot Chicken Shack micro-restaurant. Their fried chicken sandwiches come in three versions. The Blazer has homemade pickles, smoky slaw, and garlic herb aioli and comes with a side. It stacks up as superior to Chick-fil-A, but seating is only available at picnic tables on the sidewalk. Worth the additional mile off the highway. 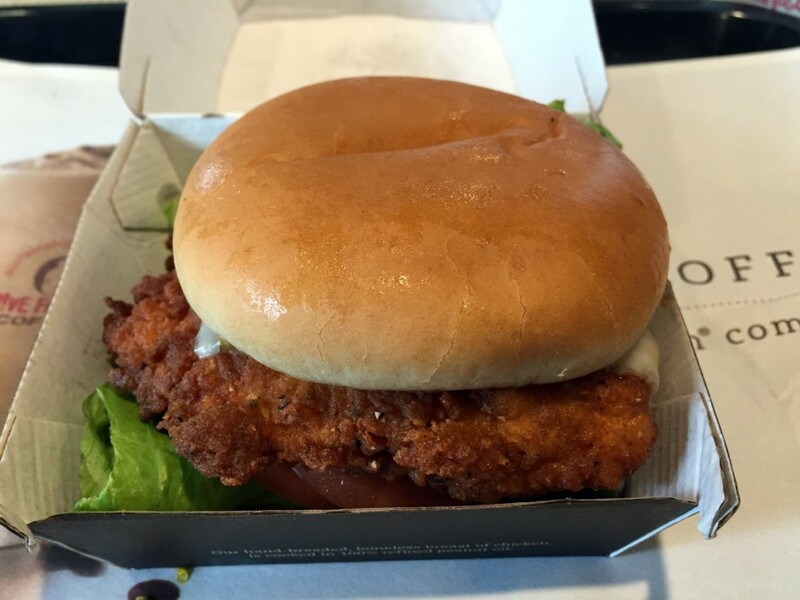 The basic Chick-fil-A is prepared and breaded fresh on site, a step up from the frozen, pre-breaded filets and processed chicken burgers you will find at other fast food. The store is large and nicely appointed and the staff is astonishingly friendly and helpful. However, if you want more than a good fried chicken filet on a standard hamburger bun with only lettuce and tomato and packets of condiments, look elsewhere. CHKCHK on NW 23rd takes direct aim at fast food. 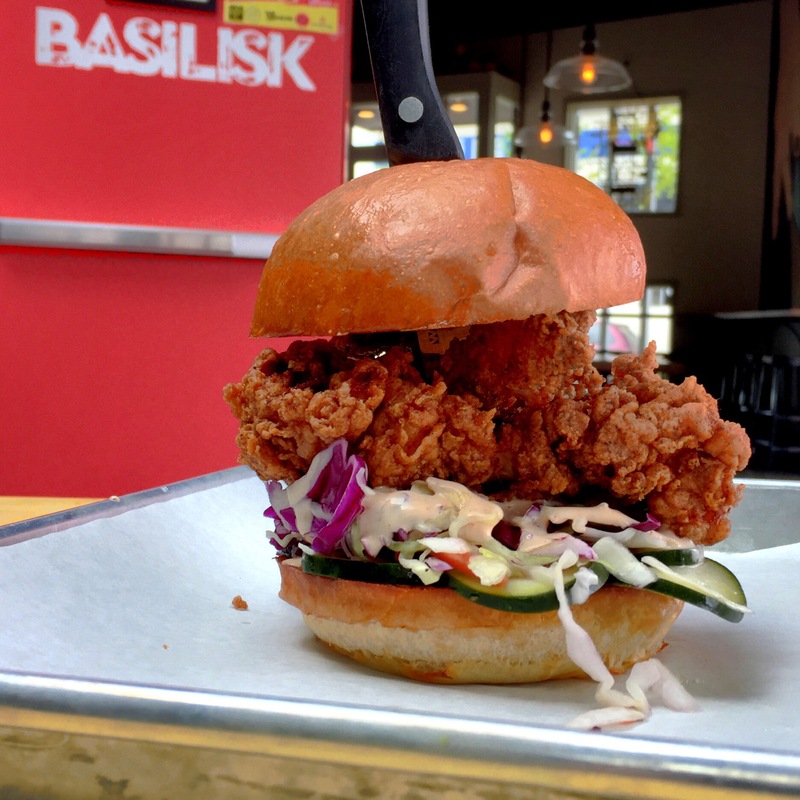 It has an impressive chicken sandwich that is make with natural hormone-free chicken, housemade buns, and comes with romaine lettuce and truffled pickle. Housemade sauces are available for 25 cents each. Seating is at picnic tables inside and service was speedy. They also have rotating taps of local beer, plus boozy soda pop creations. 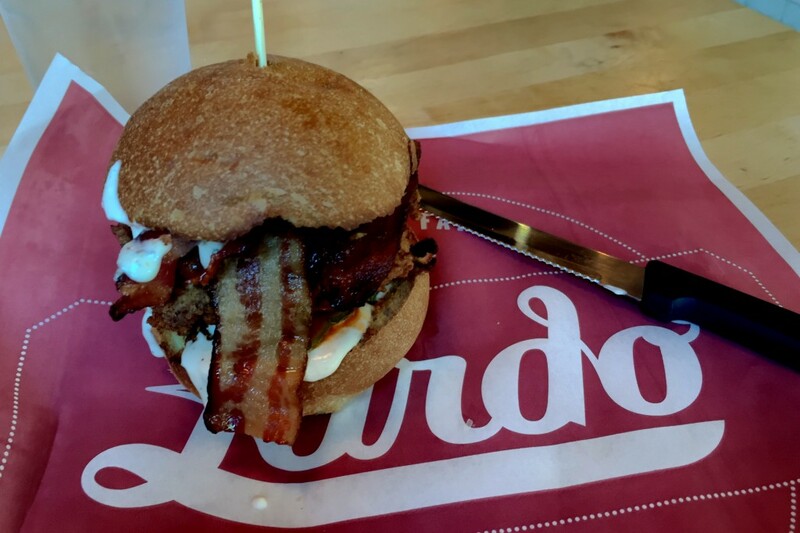 With east side and west side locations, Lardo serves up a bacon-strong fried chicken sandwich. It features bacon, pickles, ranch, and Crystal hot sauce. They give you a real knife to slice through the custom bun. For $10, it’s a deal, and you can match it with those great Lardo fries. 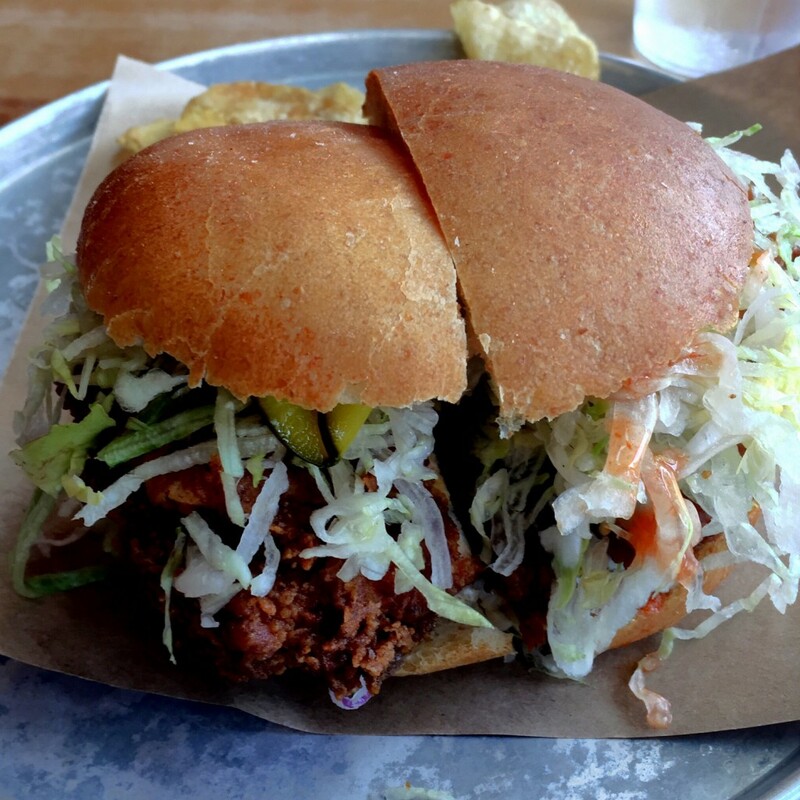 On any list of great fried chicken in Portland,Laurelhurst Market is mentioned. 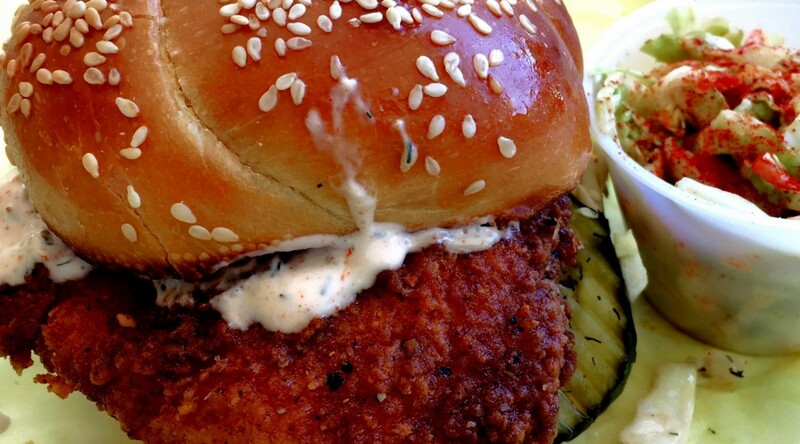 You can only get their fried chicken sandwich on Tuesdays. It is delightful and the wait is minor, with plenty of indoor and outdoor seating. It’s not fast food, but it is great food just as fast. The winner for “close your eyes and savor each bite” is the smoked fried chicken sandwich at People’s Pig. 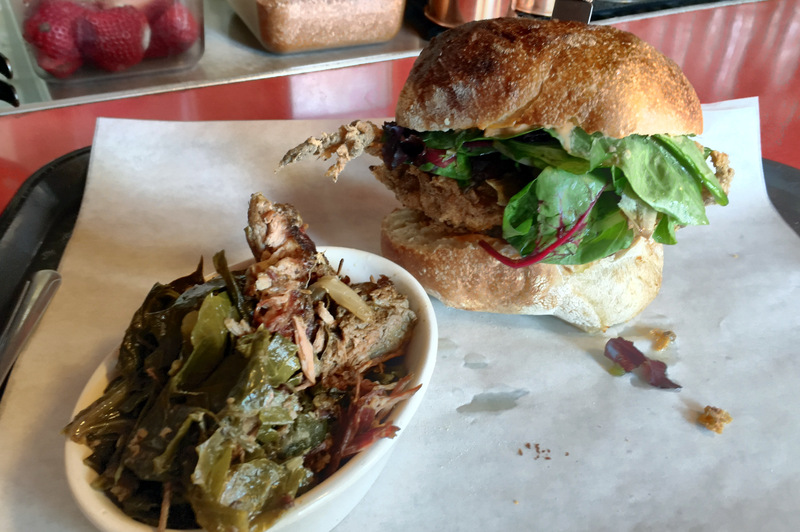 Deep smoky flavor, delicious breading, spicy mayo, jalapeno jelly and greens on a fantastic housemade sourdough roll. It comes with a hearty side such as collard greens. It’s big enough for 2 meals at $10. The wait is pretty short. The drawback is that the restaurant is very much a bbq shack, nothing even slightly fancy. You won’t care. If you’re tempted by Chick-fil-A, stay on the freeway, cross the Fremont Bridge and head to this N. Williams bbq shack.